I guess most people wonder what showers and compost have to do with each other, being showered with compost is probably not anyone’s idea of being cleaned. However there is a perfectly valid connection and it’s one we have been exploiting now for four years and to good effect. Most people want to have a warm or even a hot shower most of the time, with the exception of perhaps in really hot weather. 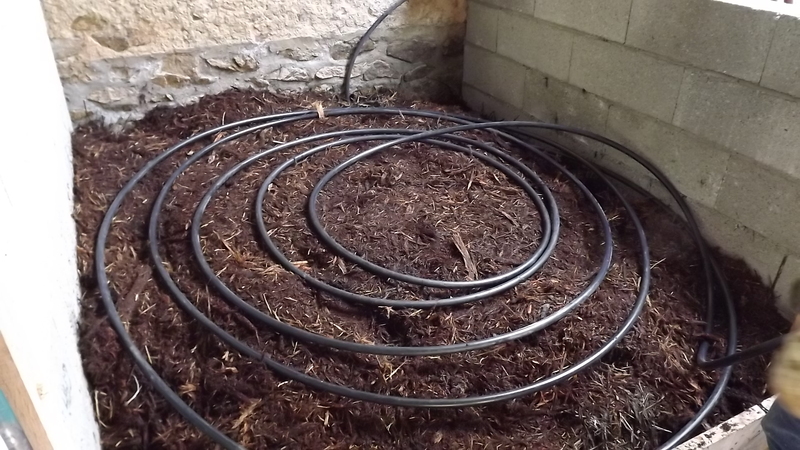 A well constructed compost heat can and does produce exceptional amounts of heat. 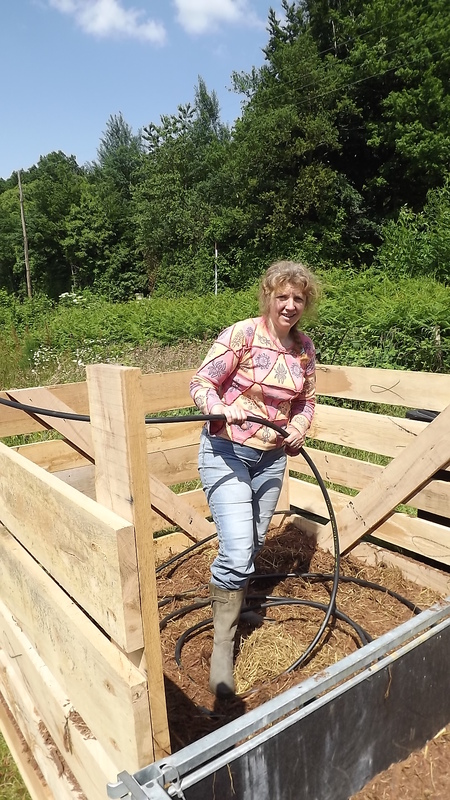 This heat is usually not exploited, and is seldom exploited to good effect outside of hot beds, which are gaining popularity again within permaculture systems, but that’s another discussion for a later date. Jean Pain a French man who has since past away did extensive research in to what he called heat heaps, it’s this research we are exploiting to heat the water for our outside showers used by our apprentices and students throughout their stays with us. this is about much more that taking the heat and using it productively though. So our first try at this was done undercover in our concrete lambing pen, this was constructed as a duel purpose walled pen, used for lambing in the spring and then used during the summer as a compost bin. 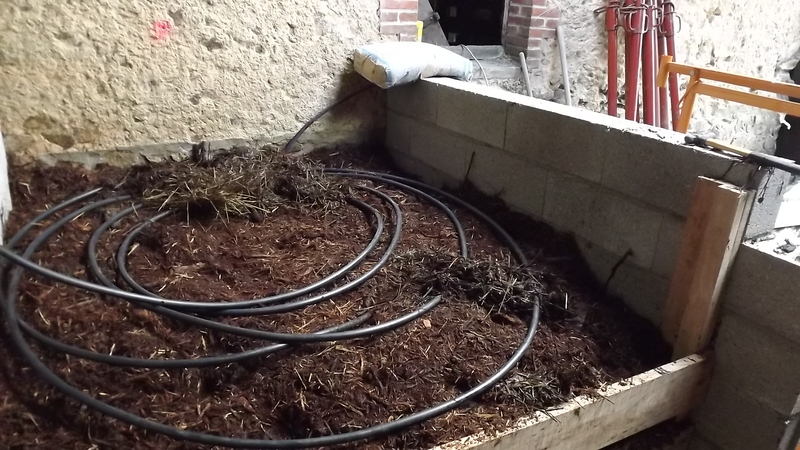 The area is two meters by two meters by one meter high making the heap four cubic meters to fill with organic material. We use two ingredients in this pile. The first is oak bark chips from the local saw mill, this is removed from the logs before they are sawn and is a waste product. We buy this in at only 8€ per cubic meter we buy it by the 10 cubic meter load delivered. We use this material for mulching throughout our vegetable and forest gardens, not just for the heat heaps. 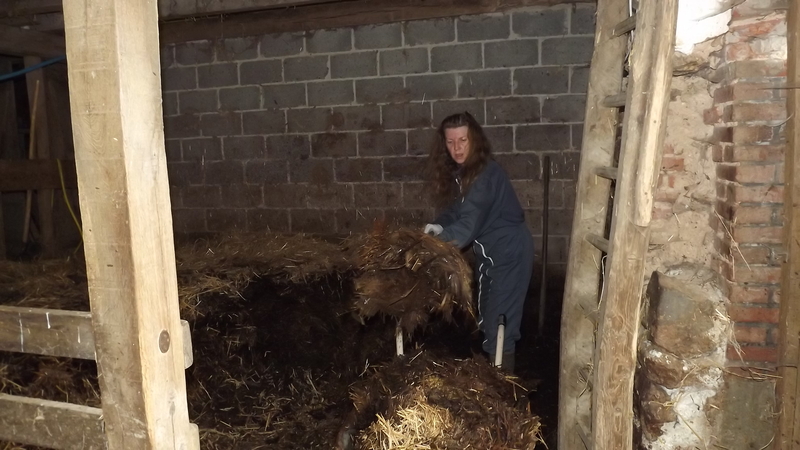 The second material is animal litter from over-wintering sheep and cows in sheds to keep them off the soil during the depth of cold and wet weather. So what this produces is a mix of organic material that is carbon rich but with a good amount of nitrogen. 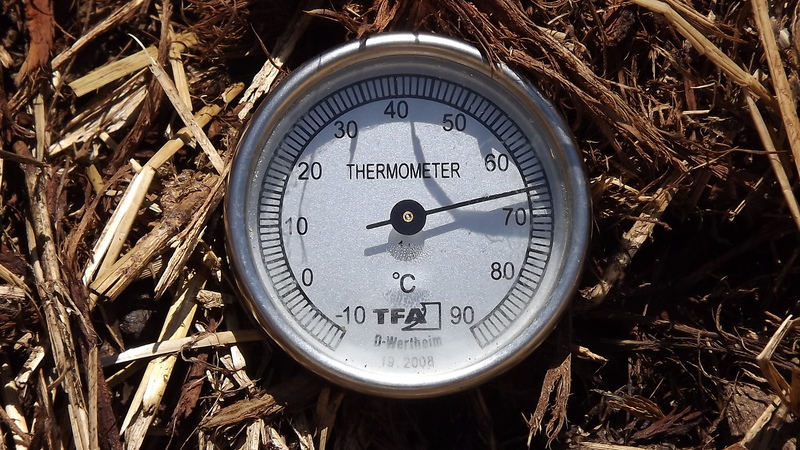 Nitrogen is the fire in a compost heap and the carbon is the fuel, both are important but we have found the higher the carbon level the longer the heap will stay hot. Once the heap starts to cool its easy to add more nitrogen from urine separated at source in our dry toilets. Building the heap is done methodically and on average takes us half a day to build. 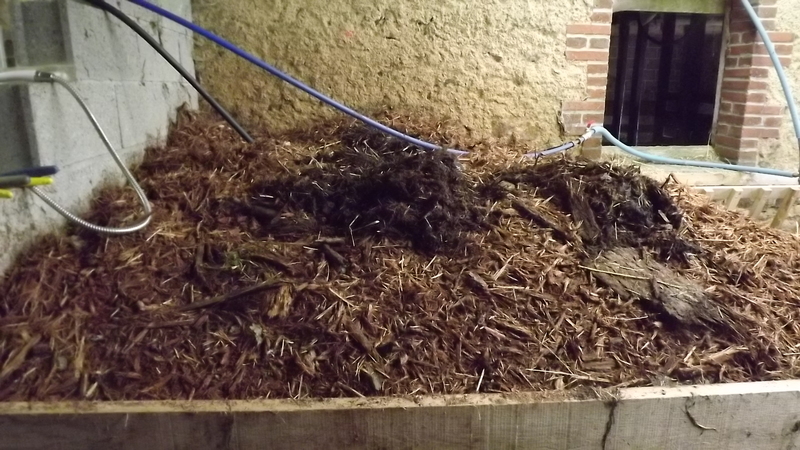 The first layer in the heap is 20cm of bark chips, followed by 10cm of litter. This insulates the heat exchanger from the concrete floor. The heat exchanger is 100 meters of 20mm rigid poly-pipe this contains about 18 litres of water. Once the foundation layer is down the first coils of pipe are laid down. Then a 10cm layer of litter is placed on top of the pipe followed by a 10cm layer of bark chips, then another layer of pipe coils. Then a 10cm layer of litter is placed on top of the pipe followed by a 10cm layer of bark chips, then another layer of pipe coils. Once each layer of organic material is laid the heap is wetted down so that you can squeeze water out of a handful of the mix. More boards are added to the front of the heap as it rises layer by layer. 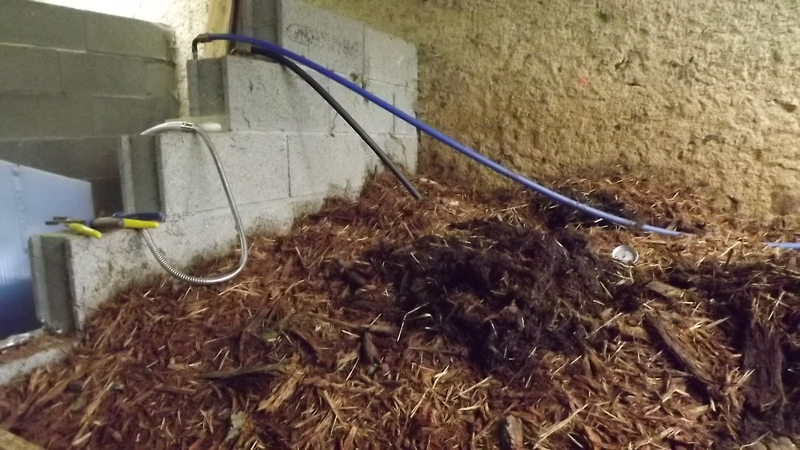 The heap is topped with as much bark and litter as we can get in place without it falling over the sides. Then all the pipes are connected back up to shower fittings and the incoming mains water. The blue pipe remains delivering cold water, the black pipe delivers hot water to the shower head. Once the heap has bean built the microbial activity starts to create the heat we are trying to exploit. Four to five days later the heat will be higher than most people can use directly and the water will need to be mixed with cold water to make a comfortable shower. We also build another heap to heat the water for our camp-site shower too. In the centre of the heaps where the heat will be highest we add the dry matter from our dry-toilets, yes that right the mixture of human faeces and toilet paper (humanure.) We endeavour to monitor the heat to ensure it gets above 60°C which renders it inert. Once the heap has finished its composting process we can exploit the compost. 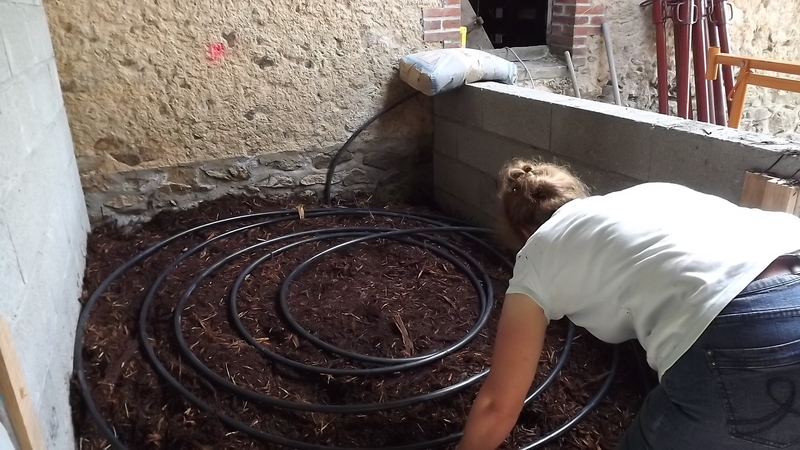 Four years of using this system in two palaces on our site has taught us a great deal, both about compost making and and the value of good quality compost. Like most aspects of permaculture no one thing makes a system work and understanding the balance of what makes compost work well is the key. While many people will tell you exact amounts of carbon and nitrogen to put in your heap to make it get hot, we have learned it’s not an exact science. Bark chips alone will compost and create heat once it gets wet but it will get very hot, dry out too dry for the microbes which make the heat and kill its-self. While it will come back to life again it will go through the same processes over and over and it will take a year or more to finish its process and become useful, this is because it’s tendency to over heat and dry out deters worms and other small creatures taking up residence and finishing the final compost stages. 50% Bark and 50% litter will work but we have found it cools quickly and need remaking and more bark added to get the heap to finish quickly. 60% litter and 40% bark can get hot but not hot enough for long enough to be practical for our purposes. However it seems to make a great worm farm and piles made to this recipe have proved to produce larger amounts or worms quicker. 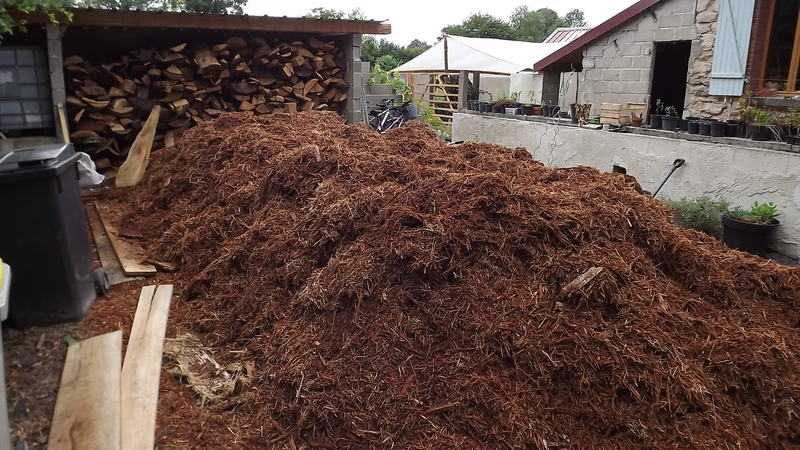 60% bark and 40% litter has proven to be the best recipe for our needs, the pile stays hot for longer with the regular addition of urine to keep the nitrogen level up. This recipe will work for Seven to fourteen weeks depending on the demands made on the shower. Each shower temporarily cools the heap and if people queue for several showers one after another day after day it will cool quickly. But it will cope well with five or so showers a day for fourteen weeks with no problem. 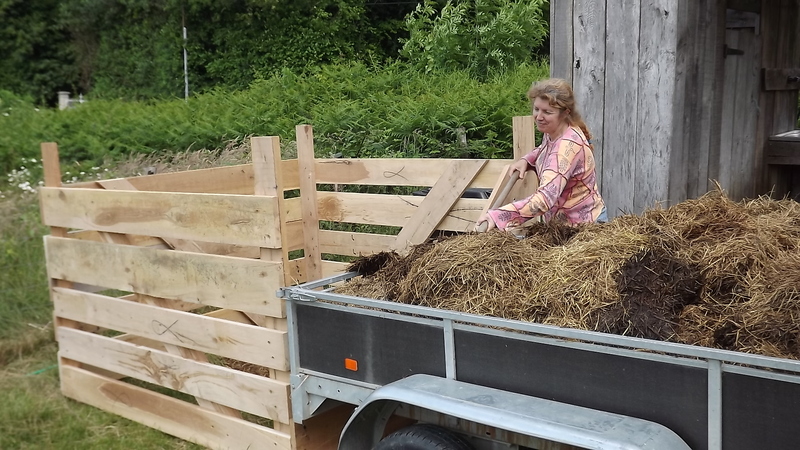 Not forgetting the icing on the cake, at the end of the composting process we have around three cubic meters of good quality 100% natural compost from each heap. This smells fresh and clean and can be used for seed sowing, cuttings, potting-up and as a general soil improver, all this on top of 500 showers per heap.